Eppley Airfield (OMA) in Omaha, NE, put its outside-the-box thinking on full display when it opened an interactive art gallery in late April. In addition to selling pieces by regional artists, the new concession features live demonstrations of select artists creating their work-a strategy that is engaging airport visitors and boosting retail sales. The gallery, believed to be the only one of its kind in a U.S. airport, was developed and is operated by Hudson Group, OMA's retail concessionaire. The 1,000-square-foot space features everything from paintings, metal works and photography to sculptures, hand-blown glass, multimedia pieces and hand-painted scarves. Gallery Size: 1,000 sq. ft. The new venture is located in the airport's north terminal, next to a Hudson bookstore in space vacated by a specialty retailer. Hudson also operates four news and gift shops at OMA. "We were looking for something completely different to fill that space-something other than another news and gift shop," explains Stan Kathol, director of finance and administration for the Omaha Airport Authority. "We wanted a specialty shop with a Midwestern flavor to it, if you will." Hudson Group Omaha spent nine months searching for potential Iowa and Nebraska artists to provide pieces for the gallery, and a jury of four longtime local artists made the final selections. "We wanted as many different mediums as possible, not only to appeal to more people, but to showcase all the art created locally," says Christie Erwin, general manager of Hudson Group Omaha. "We tried to get the best of the best, from seasoned artists to up-and-coming artists who would normally have trouble initially getting their work into galleries." Currently, Gallery Eppley by Hudson showcases work from 52 area artists. Individuals agree to keep their art in the gallery for a year and are compensated on a commission basis when pieces sell. After the year concludes, artists may resubmit their work for inclusion in the gallery's next collection. To inject even more variety, Hudson features a guest artist position, which changes more frequently. OMA's nine-year contract with Hudson guarantees the airport a minimum annual payment or a percentage of the gallery's gross annual sales of specific product categories, whichever is greater. Erwin describes the response from airport customers as "overwhelmingly positive." Kathol agrees, noting that the gallery opened just in time for three events that attract tens of thousands of visitors to the area: the annual shareholders' meeting of Omaha-based Berkshire Hathaway, the prominent investment firm owned by billionaire Warren Buffet; the College World Series; and trials for the U.S. Olympic swim team. Having the gallery ready for the increased traffic generated by these high-profile events gave it maximum exposure right from the start. "The gallery helps portray Omaha and the airport as modern and progressive and shows visitors what Omaha has to offer in terms of the arts," Kathol comments. "For the short time it's been open, we've received a lot of positive feedback. It's a new, exciting and innovative concept." The canvas for OMA's new concession concept was prepared last year, when airport officials started looking for a new retailer to replace a departing tenant. At the same time, Hudson's contract was coming due, and the global travel retailer was considering changes to some of its stores. Erwin pulled from her personal palette and suggested an interactive art gallery. Years ago, she had arranged for artists to demonstrate and sell their art in the nearby casino where she used to work. "The concept worked exceedingly well, so I knew from experience that an art gallery might be a good fit here," she explains. After Hudson executives approved the concept, Erwin presented it to OMA officials, who immediately embraced it. "I thought it was great," Kathol recalls. "We were looking for something unique." Beyond simply adding a new retailer, management also wanted to encourage more browsing by the airport's approximately 4 million annual passengers. "We're not a large connecting hub and don't have a tremendous amount of physical space," Kathol notes. "People get in and out of our airport pretty efficiently-there's not a lot of dwell time." Hudson's gallery proposal fit the bill, and a vacant corner store proved well suited for the new venture. With two walls of glass windows, it affords twice as much visibility for artwork as a conventional storefront. Hudson further opened the space by removing part of the wall that separates the gallery from the bookstore next door. "Generally speaking, people who like books also like art, so it's a perfect match," Erwin comments. 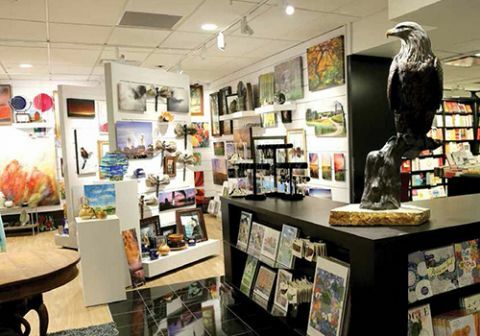 New foot traffic from the gallery has helped increase sales in the bookstore, she reports. The concessionaire enhances the gallery's novelty and draws customers inside by staging live demonstrations. On any given weekday, airport visitors can watch a professional sculptor, acrylic painter, jewelry maker, woodcarver or other artist at work, tapping new creative muses. Some of the artists delight young visitors by giving them lumps of sculpting clay, Erwin notes. Two employees-well-known local artists Russell and Penny Christensen-fill in if a scheduled artist unexpectedly can't make it. Hudson and OMA leverage the gallery's interactive nature and boost the retailer's visibility by showing live video of the artist demonstrations on two 60-inch television monitors mounted outside the store. The screens put the artists squarely in sight of passengers coming from the parking garage or emerging from a nearby elevator and escalator. "They attract a lot of attention," Erwin notes. "People are curious and watch them work for a long time and ask a lot of questions...We've found that people tend to linger here while waiting for a flight or waiting to pick someone up." From a retail perspective, Hudson makes a concerted effort to ensure that there's something for everyone in the gallery. Prices consequently range from .50 cents for a small piece of leftover blown glass known as a "forge drop" to $24,000 for a 4-foot-tall bronze eagle sculpted by Russell Christensen. "We want everyone to be able to afford to buy art," Erwin says. Purchases are packaged carefully for travel or shipped to customers' homes. Departing local passengers can leave purchased artwork at the gallery and pick it up upon their return. "The fact that the store is in an airport has not dissuaded people from buying things," Erwin notes. Erwin says the gallery at OMA reflects Hudson's willingness to try new things and could springboard to other novel retail attractions. "I don't know if this will become part of a national trend, but I think it's definitely working here," she muses. "It's perfect for this airport." "Airports these days have to think outside the box a little bit," she continues. "There are so many news and gift stores in airports, so there's a need to stand out...People are looking more for an experience-something to do with their time when they're in an airport. So the trend is toward trying to find out how to give them that experience." Kathol agrees, and notes that OMA's 25-year master plan could very well include other unique and innovative retailers. "If things work out well, most assuredly we'd consider this and other concepts in our future terminal master plan because we'll have more space available," he says. "We want to give our customers a good experience and give visitors to Omaha a good first-and last-impression of the city."